Welcome to the 2018 “Living an Elevated Existence” Telesummit Affiliate Center! Below you will find e-mail copy, images, and suggestions for Twitter, Facebook and other social media sites to use for promoting the summit. Please feel free to edit the copy to fit your style, voice and audience..
To download images, right click and select “save image as” and save the image to your computer. 2 — Ready to Heal, Manifest & More? It’s a brand new year, and you have the power within you to create anything you desire! How does a year filled with healing, intuitive guidance and manifestation miracles sound to you? What if I could offer you access to expert advice, tools and techniques proven to help you do just that, and not only attain a higher consciousness, but to sustain it? Imagine a life free of limitations, full of opportunities, and overflowing with abundance, healing and wellbeing — where struggles with relationships, health, weight, money or career are at a minimum, and love, freedom and happiness are part of your every day experience. It may sound too good to be true, but I assure you living this way IS possible, and I, along with 23 top experts and bestselling authors in the spiritual and self-improvement field will show you how in this extraordinary and FREE 3-Month Online Series called “Living an Elevated Existence Mind, Body & Soul Summit” starting Jan. 16! Sign up for your FREE pass now! 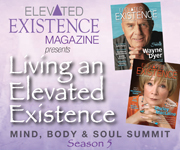 The “Living an Elevated Existence Summit” will teach you how to live at a higher level —a higher consciousness — by elevating your mind, body and soul! Whether you are looking to re-train your mind, heal your body, connect with your guides, discover your soul purpose or enhance your intuition, this online series has something for you! Best of all, the event is all online, FREE to listen to, and is taking place over 3 months, with only two live interviews each week. This makes it easier for you to tune into all the amazing advice and access the tools each speaker offers at a comfortable pace! And since the recordings will be available for a full 48 hours after each interview, you can either listen live, or at any time convenient for you. Whether you chose to elevate yourself by relaxing with a cup of tea, a warm blanket and your computer in the evening, or in the morning during your daily commute — the choice is yours! During this 3-month event, you will gain access to expert advice, tools, methods and techniques to implement into your life right away! Plus, each speaker — including me — will be giving you access to a “Free Gift” and a “Special Offer” just for listeners of the Living an Elevated Existence Summit! 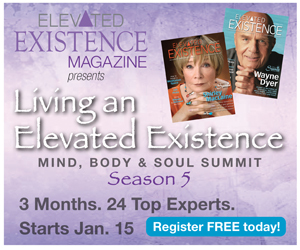 If you haven’t already signed up for FREE Season 5 of the Living an Elevated Existence Summit, it’s not too late! Sign up now and hear me interviewed by Elevated Existence Magazine founder, Tammy Mastroberte, live tomorrow at Noon eastern time (with a free replay available for 48 hours)! I’ve joined a line-up of 26 top experts and bestselling authors in the spiritual and self-improvement space to help you live life at an elevated level — in mind body and spirit. In my live interview tomorrow I’m revealing [enter your topic here and any key points of your talk]. And don’t worry if you can’t make it live because immediately following the interview a replay will be available for a full 48 hours! I’m also giving a Free Gift to all listeners AND will announce a very special offer that will knock your socks off — one you can only get through the Living an Elevated Existence Summit! During the summit, we will be using the hashtag #ElevatedSummit so be sure to include it at the end of your tweets!